If you save for years and manage to retire with a decent bundle, you might be able to purchase a yacht someday. It’s not a luxury many people can enjoy, but the ones who do speak glowingly of the serenity they relish during evenings floating the waters of the world in grand style. Some find this pastime so irresistible, they’ll pay top dollar for the most luxurious craft they can find. Using SYS International Yacht Sales prices as a frame of reference, you can see precisely how much these vessels are worth compared to more average oceangoing boats. 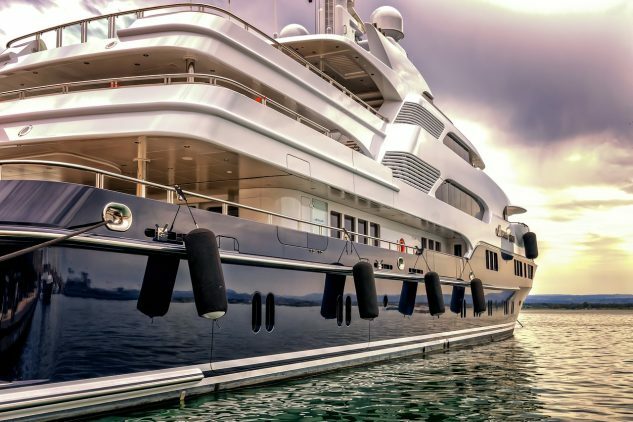 Check out the most incredible yachts on the seas and what their owners have been willing to pay for them. On record, the most expensive yacht on the planet is called the History Supreme. At 100 feet in length, it’s surprisingly small for the price. This charmer was dreamed up by UK luxury designer Stuart Hughes. From start to finish, it took three years to build, but the designer’s efforts didn’t go unrewarded. He sold it to an anonymous buyer in Malaysia for more than $4.5 billion! What makes a vessel such as this one more valuable than many on-shore mansions? The hull is adorned with solid gold and platinum, equal to more than 100,000 kg of precious metals. The History Supreme also boasts a huge master bedroom with a luxury bathroom, a wall made of rock from a meteorite, a statue composed of T-Rex bones, a 24-carat gold-walled aquarium, and a dozen more over-the-top embellishments that its presumably Malaysian owner now enjoys. Though it’s valued at substantially less than the History Supreme, the Seven Seas sold in 2010 for nearly $200 million. Netherlands-based yacht company Oceano commissioned world-renowned designers Nuvolari and Lenard to devise and construct the 282-foot luxury vessel. But what’s truly impressive is the yacht’s power. It can accelerate to 20 knots, which is unusually swift for a luxury vessel. Russian oligarch Alisher Usmanov owns the Dilbar superyacht, a 360-foot enchantress built in 2008 by Lurssen Yachts. Usmanov paid an impressive $256 million for this one. The owner primarily uses this ship to visit his own private islands, so it rarely may be spotted on the open sea. Some of its more impressive features include multiple swimming pools, a helipad, and enough space on deck for 20 guests and 48 crew members. Usmanov never leaves port without a full staff on board to man the huge vessel and meet his every need. Roman Abramovich, another Russian billionaire, purchased the Eclipse a few years back. The final sale price was kept a secret, but experts believe it sold somewhere in the range of $1 billion to 1.5 billion. This creation came out of the minds of Blohm and Voss of Hamburg. At 536 feet from stem to stern, it’s the second-longest yacht on the ocean, which means it has ample space for the 24 guest cabins, multiple hot tubs, two swimming pools, two helipads, three launch boats, and a disco hall. It takes 70 crew members to keep the Eclipse operational. In addition to its size and other features, this ship may lay claim to being the safest yacht in the world, as well. It carries a mini submarine that can dive 50 meters, and that can be employed either for fun or escape from attack. The ship is also retrofitted with a missile defense system, and bulletproof windows and armor plating in the master bedroom. Last but not least, Abramovich is able to maintain utmost privacy on board, thanks to the system of lasers that sweep the surrounding area. If paparazzi attempt to slip into his region of the sea armed with cameras, a laser beam will inhibit the intruders’ ability to snap a photo with their equipment. The Lady Moura is another beauty designed by the Blohm and Voss shipyards, but this vessel is older than most of the others on this list. It was manufactured in the 1990s for Saudi Arabian businessman Nasser Al-Rashid with a price tag of $210 million, but the yacht has only grown in value since. If it were sold today, this goddess of the oceans would likely be worth twice as much as her initial purchase price. The Lady Moura is a floating oasis that carries real sand and beach chairs, palm trees growing in pots on the deck, and a swimming pool. It’s easily recognized in port by the name on the side and stern, which is written in giant gold letters. It’s one of the top examples of luxury among seaworthy vessels around the world.